Mitchell Wondolowski volunteers for the Lobster Conservancy Juvenile Lobster Monitoring Program and counts lobsters on Gerry Island much of the year. He is on the rocky coastline at Gerry Island. 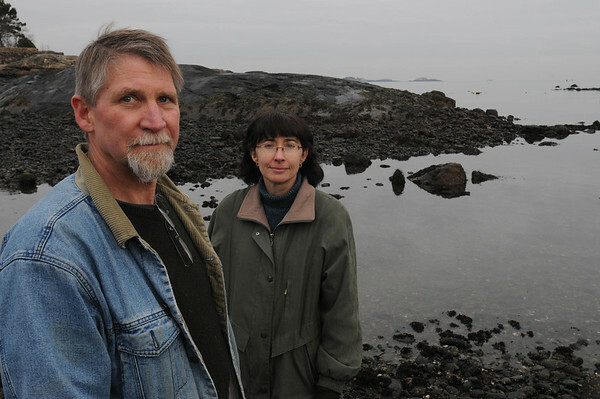 Denise Fiore, the team leader for the Lobster Conservancy Juvenile Lobster Monitoring Program stands with him in front of Gerry Island..
Photo by Ken Yuszkus/Salem News, Wednesday, February 15, 2012.